Winter is coming, and no matter what WHO says about meat, dammit, all of us need an occasional treat to balance the scales with life’s tricks. Herewith Chicken Livers with Passion Fruit, Pomegranate and Caramelized Dumpling Squash, exactly the kind of meal that Jody and I cook up at home when things have been crazy and we need to remind ourselves to slow down and savor what’s in front of us. In the last month we’ve been to Haiti, where Jody cooked and taught up a storm and I photographed it all and much besides. Right before our departure, one of Jody’s cooks fell and broke her ankle, which will keep her out of the kitchen for several months. Since out return Jody’s been picking up the the slack (note the state of Jody’s hands in the photos), while I’ve been processing photos for all of the institutions we visited. When we lift our noses from the grindstone, this is what we eat. Chicken livers are a bargain – the passion fruit in this recipe will probably cost about the same as the livers themselves. Nevertheless, in our fat and cholesterol conscious age chicken livers are less and less available. I’m surprised at how many people I now encounter who have never eaten liver of any kind. (Bruschetta with sautéed rabbit or duck livers are one of life’s great culinary treats, but that’s a different post.) People who seek out artisanal (read fat-marbled) pork, avoid liver. Why? I don’t get it. Cautions about eating organ meats have morphed in many people’s minds into an outright prohibition against eating them at all. Jody and I treat ourselves to chicken livers four or five times a year, and sweetbreads about half as often, which works out to about one indulgence a month. My cholesterol levels live on the first floor and Jody’s are in the basement, and we eat well. You can have your cake, er, liver, and eat it too, just not every day. If the sight of pink in your meat causes you to shudder, then stop reading her. Chicken livers are best if not cooked past medium, lest they lose their silky texture and start to become rubbery. At their most basic, a simple sauté in butter or olive oil with some shallots and thyme or finely chopped garlic will provide you with a feast for short money and almost no effort except cleaning the livers themselves. A sharp paring knife makes quick work of removing the fat and sinew joining the lobes of each pair of livers. Tart autumnal fruit – pomegranate, passion fruit, blood oranges, cranberries, lingonberries – can really step up the dish. There’s something about the combination of acid and unctuousness that can’t be beat. Think of pickled mustard fruits with paté or tart fruit coulis often served with fois gras. On a different note, hazelnuts (dukkah!) are also a fine compliment. Note: In Haiti Jody worked with cooks in various Partners in Health-affliated sites: Zanmi Beni, a Porte au Prince orphanage, at HUM (Hôpital Universitaire de Mirebalais) and at the Zanmi Lasante (Partners in Health) campus in Cange, in Haiti’s Central Plateau. Here’s a shot of Jody with the cooks at HUM. The rectangular dish with red and white in the front is pikliz. Francois, the chef standing behind Jody, was very insistent on everyone wearing hats. For the record, Jody takes her hat off when she goes to bed. Scrub the squash clean. Cut the squash in half, scoop out the seeds, cut the squash into 1-inch wedges. Season the squash with salt and pepper. Heat 1½ tablespoons butter in a large saute pan over medium heat. When the butter starts to foam, add the squash, cover, reduce the heat to low and cook until golden brown, about 20 minutes. Flip the squash over, do not cover, and cook until the squash are tender and the second side is golden brown, another 10 minutes or so. Increase the heat a little if the squash is tender but not brown. Just before removing from the pan, add half the honey, passion fruit juice and thyme and toss. Transfer to a plate. Meanwhile, clean the livers of sinew, fat and any green stuff (see my note below). Pat dry with paper towels. Season with salt and pepper. Melt 2 tablespoons butter in a large saute pan over medium heat. When the butter starts to foam, add the sage leaves and cook until crisp. Keep an eye on the heat – if the pan gets too hot the butter will burn. Drain the sage leaves on a paper towel. Add the livers and cook on one side until brown, about 3 minutes. Flip and cook on the second another 3 minutes. Transfer to a plate. The cooking time is dependent on the size of the livers and the doneness that you like. Add the remaining butter to the pan with the shallots and season with salt and pepper. Cover and cook until tender, about 5 minutes. Remove the lid, add the garlic and pepper and cook until the shallots just start to caramelize, about 3 minutes. Turn off the heat. Add the the remaining honey, passion fruit juice and thyme. Swirl around. Return the livers to the pan to heat through. Put a couple of wedges of squash on a warm plate. Arrange the livers around the squash and then spoon the shallot mixture over the livers. Garnish with sage leaves and pomegranate seeds. Very rarely you may find a chicken liver with a green patch or even a green oblong organ attached. This is the gall bladder. Just cut it away, without rupturing it – the liver will be fine. If the gall bladder is ruptured it releases bile, which taints nearby flesh green. It also has a very bitter flavor, so cut away any green tissue. The rest of the liver will be fine. During our week in Haiti I was cooking with the culinary teams at three Partners In Health sites. I discovered many things, and one of my favorites was using passion fruit in savory ways. The cooks were surprised and delighted to see me use passion fruit in a tomato sauce – they only use passion fruit for juice. When I was shopping/brainstorming for this post, I first bought a pomegranate – great acid and a high wow factor with those beautiful seeds. Then my gaze landed on a basket of wrinkly passion fruit and I decided to give them a try as well. They don’t have the beautiful seeds of a pomegranate, but man are they delicious. I couldn’t resist using both. This entry was posted in chicken, Dinner, Entree, Poultry and tagged chicken, liver, old school, passionfruit, poultry. Bookmark the permalink. And added to Bolognese sauce is the an authentic way to finish. Hard to find fresh ones! My chicken liver Pate is a combo of calves liver roasted and chicken liver sautéed in chicken fat and onions! A most beautiful and appetizing post from both of you! Klausbernd loves liver so we have decided to get some from the local butcher for the weekend. Interesting; what you call squash is a kind of pumpkin here, recommended to be peeled. I find peeling the pumpkin the hardest work, so to cut it like this looks very delicious. :-) Do you roast the seeds? This is fantastic! I grew up eating chicken liver and have only cooked it once in my life. My teenage son is very adventurous and kept asking me to prepare it for him. I wish I would have had this recipe for his first liver experience. I love the way the squash is prepared here and crispy fried sage leaves are to die for, in my opinion… Beautiful post Ken and Jody! I wonder if this will show correctly. The picture on right shows two kinds of liver, one is calf/veal and the other beef. I remember calf liver was easier to chew and probably milder and I think the three pieces on right are of calf and the rest beef but I could be wrong. These are from 2010. The first picture on left is beef tongue I think. 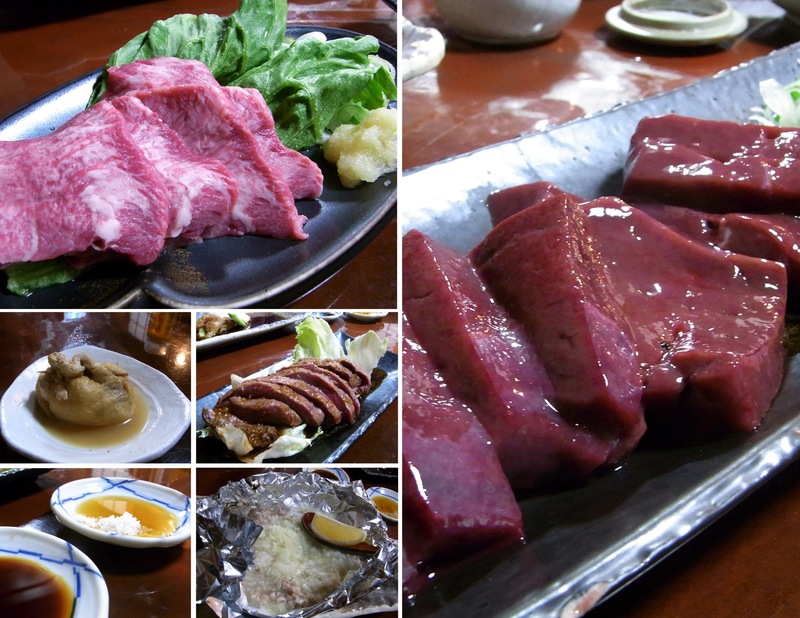 The middle picture is horse steak – very tasty. Sorry, I only meant to post the link, not the photo itself!! The middle left picture is of vegetables and probably “mochi” (rice cake) wrapped in a thin fried tofu “bag” and tied with “kanpyo” (https://en.wikipedia.org/wiki/Kanpy%C5%8D_(food)) and cooked in dashi. We often get this bag in oden (https://en.wikipedia.org/wiki/Oden). The picture of sliced meat right in the middle is horse steak. Bottom left is soy sauce in one dish and sesame oil with salt in the other. They are for the liver sashimi. Bottom middle is I think chicken cartilage chopped up and cooked in foil with onion. The restaurant is a specialist in serving offal among other meats. It’s very funky. The link for the horse sashimi didn’t work as intended but if you scroll down the bottom left picture with very red meat is horse sashimi. Wow your pictures and recipes are incredible – i adore your Blog. This is a particularly good recipe for this time of year! I am already hungry! I am with you on the liver. There is nothing as nice as fried liver (calf or sheep) with onions and a little salty bacon. My butcher friends tell me it is less and less requested. Many have never an probably will never enjoy this fantastic source of iron and flavour. Lovely photos and recipe as always. Sheep liver? I’ve never even heard of that (or lamb, for that matter) over here. I ate mutton as a student in Europe – I don’t think I’ve ever even seen it here. Such. A shame. It is delicious. I promise to post it soon so you can see. Oh I can’t believe I missed this. What a stunning recipe. Every week I think I’ll buy chicken livers and I dont for lack of a good recipe. I’ve only ever had it chopped, but these look so good! Thank you for sharing!